Life on land requires oxygen and carbon dioxide. Nearly all types of organisms use oxygen to obtain energy from organic compounds. Oxygen is an essential fuel for body tissues. 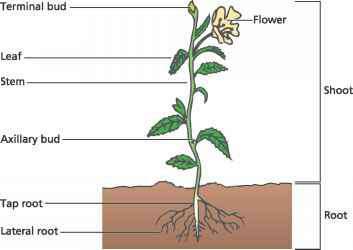 Plants need carbon dioxide (CO2) for photosynthesis. Carbon dioxide comes from animals when they exhale and from decaying organic matter, and is absorbed by water from the atmosphere. This exchange between living organisms and the environment is a critical factor that affects the development of all life. 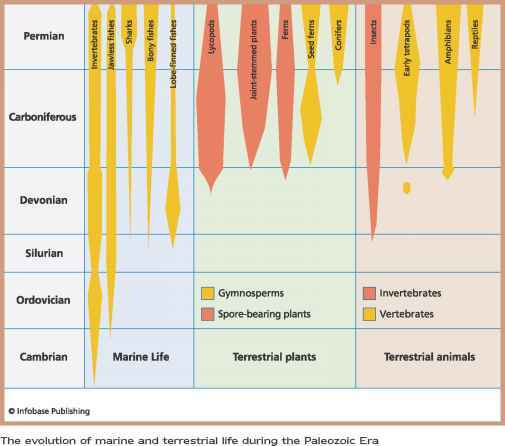 The explosion of life in the sea and the rise of marine and land vertebrates happened at the same time that oxygen was becoming increasingly abundant, during Precambrian times and the Paleozoic Era. The first photosynthesizing creatures were cyanobacteria that originated about 3.5 billion years ago. The oxygenation of the oceans by the Early Paleozoic led to the rapid development of multi-celled organisms. Oxygen levels in the atmosphere rose accordingly, fed by an increasing abundance of plants on both land and sea by the middle of the Paleozoic. An enormous greening of the land took place during the Carboniferous Period, as vast tropical rain forests spread throughout the hot zones of Earth's equatorial regions. Today these regions are located in North America, Europe, and Asia, and they still contain vast coal reserves—the fossilized remains of plants and animals from the Paleozoic. These same reserves helped fuel humankind's great Industrial Revolution. an astounding 35 percent—a phenomenon that resulted in some spectacularly large organisms, including gigantic insects and other arthropods.